There are several basic parts that each cell contains just like our bodies, the organelles are needed organs for the cell to live, all this information must be contained within their DNA. I am not going to go through the function of each of this organelles that is something for a biology 101 class, but rather tell you the biochemical pathways that make these structures within the cell. 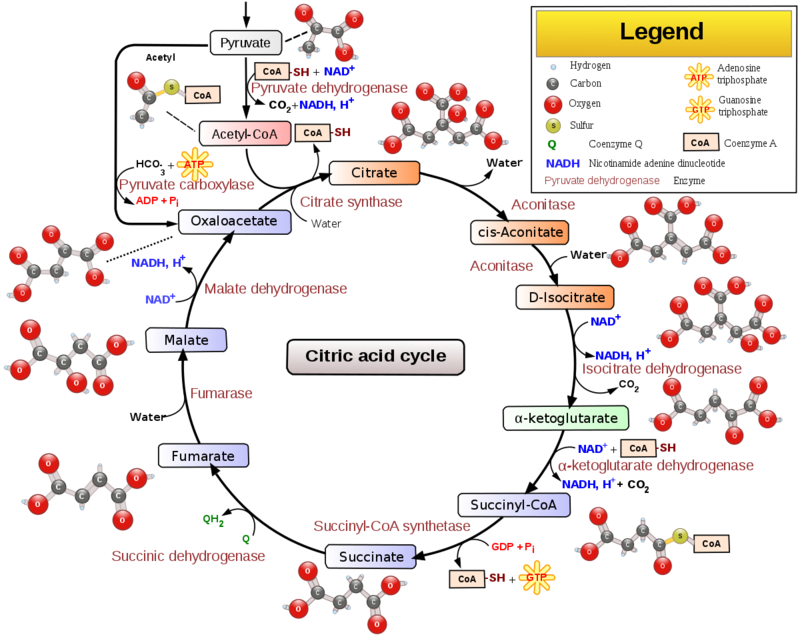 This goes from Glucose to Pyruvate the entire biochemical pathway all done with a Sythase protein. Energy Processing Pyruvate to NADH+ Biochemical protein processes. Then using the Electron Transport Chain proteins in the wall of the Mitochondria the cell processes this NADH+ into Faramate and Water. This is the final biochemical pathway from which using ATP Synthase ADP is converted into ATP, the entire process happens within two protein membrane constructed by a gene. So now we have a source of Power, for the cell this system will cause most of the metabolic functions in the cell to be catalyzed by enzymes which use ATP to function. One of these is the Ribosome which makes all the proteins in the cell. The DNA can be converted into mRNA via a RNA Polymerase. I want you to notice in Translation Process that tRNA proteins are doing the work of moving the Amino acids into the ribosome with the correct Anti-codon, The ribosome is made up of four sub units proteins that do the function of Protein Synthesis. Vmedvil: You seem very interested in biochemistry, but your knowledge is still incomplete. If you want, I can suggest some resources to help you improve. Strictly speaking, an RNA polymerase does not convert DNA into RNA. Instead, it uses the DNA as a template to synthesize a new strand of RNA. tRNA molecules are not proteins; they are RNA. The ribosome is made up of four sub units proteins that do the function of Protein Synthesis. Ribosomes contain both proteins and rRNA, but the actual parts that catalyze peptide bond formation are rRNA, not proteins. Also, ribosomes usually have 2 subunits, not 4. That First one was a typo i meant to say a "Set of Sythase" Proteins meaning many proteins that do a synthesis of some chemical into another. as for a count them is a set of 20 proteins that start certain reactions. tRNA proteins are Transfer proteins that carry the amino acid into the Ribosome, they have RNA bases on them but are very much a class of protein, they are a type of transporter the tRNA , which means tRNA as RNA transporter. It has been cut into this shape by the transporter protein to send it physically to the Ribosome. They have Four subunits in the gene structure and how they are produced, there is two large and two small subunits that fuse into the Large and Small subunit which is the fusion of one of the smaller large and small subunits, when actually made. tRNA is not a protein, nor is tRNA a protein when bound to an amino acid. The tRNA-amino acid molecule only contains one amino acid, which is therefore not bound to another amino acid. As such, it does not constitute a polypeptide and is not a protein. A molecule bound to an amino acid is not a protein; these are very common in chemistry and pharmaceuticals, but are not classified as proteins (for example lisdexamphetamine).